With a high metabolism, you take in calories but don't see the instant gains on the scale that others who have different hormone profiles and genetic dispositions register. You're likely an ectomorph, a body type characterized by a lanky, long frame, narrow shoulders and little body fat. Fitness folk refer to you as a "hardgainer," meaning it's challenging to build muscle mass -- but that doesn't mean you're destined to be scrawny and weak. With a little extra work with heavy weights and high-calorie healthy foods, you can beef up your willowy physique. Gaining large amounts of muscle, or bulking, is a challenge as your metabolism prevents you from holding on to extra mass, but a calorie surplus is the only way to add weight. A man needs between 250 and 500 extra calories daily to encourage the development of healthy muscle. Because your metabolism is high and you're not prone to putting on a lot of fat, aim for the 500-calorie-per-day surplus to add about 1 pound per week. Make a fair amount of those extra calories come from high-protein foods, rather than from white bread, sugar, soda and fast food. Aim to consume about 0.55 gram of protein per pound of your body weight per day. For a 160-pound man, that's approximately 90 grams per day, or 20 to 25 grams at each of three meals and 10 to 15 grams at each of two snacks. Eat whole foods whenever possible -- these include vegetables, lean proteins, dairy, whole grains, fruits and healthy unsaturated fats. Choose starchy vegetables, such as sweet potatoes, potatoes and peas, and serve them alongside leafy greens. Higher-calorie fruits include bananas, mangoes, papaya, avocado and pineapple. Roast lower-calorie vegetables, such as broccoli, cauliflower and eggplant, with coconut or olive oil to boost the calorie count. Whole grains, such as brown rice, quinoa and oatmeal, offer healthy fiber and nutrients that support muscle growth. Protein sources at meals might include skinless poultry, lean beef, eggs, white fish, salmon, shellfish, tofu or dried beans. Serve yourself a generous 5- to 6-ounce serving to get adequate protein and extra calories. Get snack-time protein from string cheeses, cottage cheese, deli turkey or hard-boiled eggs. Schedule a protein-rich snack that also includes some carbohydrates about 30 minutes before and after your workout, which can boost muscle growth and repair. Whey protein mixed in milk with a banana is convenient, but whole foods like tuna salad on whole-grain bread or a roasted chicken breast with a sweet potato are also options. You know what types of foods to eat, but putting them together into meals can be a challenge. If you're not into cooking, you can still microwave oatmeal with milk and scramble a few eggs on the side for breakfast. Cook several chicken breasts to store in the fridge during the week so you can grab one to go. Eat the chicken with a generous serving of brown rice, broccoli topped with Parmesan cheese and sliced avocado. For dinner, boil whole-wheat pasta, drain and toss with a tablespoon of olive oil. Have the pasta with marinara sauce mixed with sauteed lean ground beef and a side of peas mixed with butter. Snack on deli turkey with whole-grain crackers. Serve up Greek yogurt with mango, almonds and shredded coconut, or have whole-wheat bread topped with almond butter and sliced bananas. Between meals, get even more extra calories by drinking milk or 100-percent fruit juice, grabbing a handful of cashews or blending together a smoothie with yogurt, orange juice, strawberries and spinach leaves. Gaining weight without exercise promotes an increase in body fat. When you gain a pound but don't exercise, almost two-thirds of that pound is fat. Increasing your body fat stores does little for your appearance or health. You build muscle in response to tension. When the muscle feels stressed, as during weight training, it grows to adjust to the resistance presented. Conduct a lifting routine that uses free weights. You use more stabilizing muscles and encourage greater muscle growth overall when using barbells, kettle bells and dumbbells. Target every major muscle group, choosing compound exercises such as squats, dead lifts, pulls and presses, instead of isolation curls or seated leg extensions. Train the same body part only every other day to allow for recovery, which encourages growth. Your routine may involve three to four days of training weekly. Heavy weights promote size development, too. 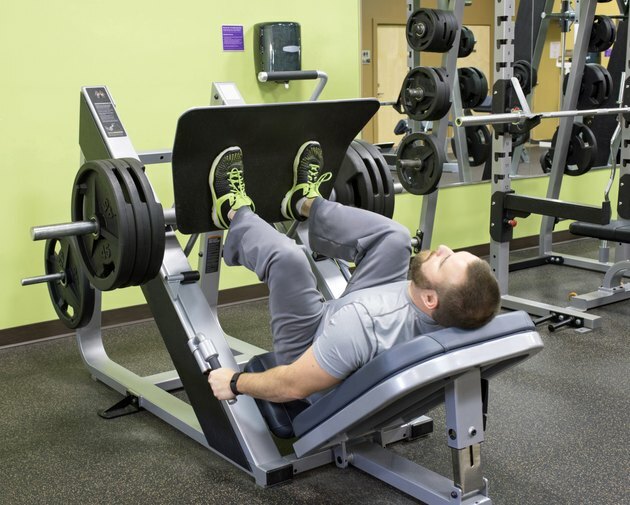 Use a weight that induces fatigue within eight to 12 repetitions for three to five total sets. Rest just 45 seconds between each set to spur muscle growth. Some cardiovascular exercise is still important to your health even though it burns calories. Plan on doing at least 20 to 30 minutes most days of the week to keep your heart and lungs healthy, and to boost your appetite.